What Is a Gray Wolf's Diet? The gray wolf, or canis lupus, is the largest wild member of the canine family. They can weigh anywhere from 45 to 175 pounds. They are social animals that live and hunt in packs. Gray wolves are carnivores that rely on the meat of large hoofed animals for their survival. They primarily hunt animals such as elk, deer, moose and caribou, but they are also known to eat smaller animals such as beavers and rabbits. They also scavenge for food and eat animals that may have died from natural causes. Gray wolves hunt their prey in packs. They work together in groups of four to seven to stalk and take down animals that are much larger than them. 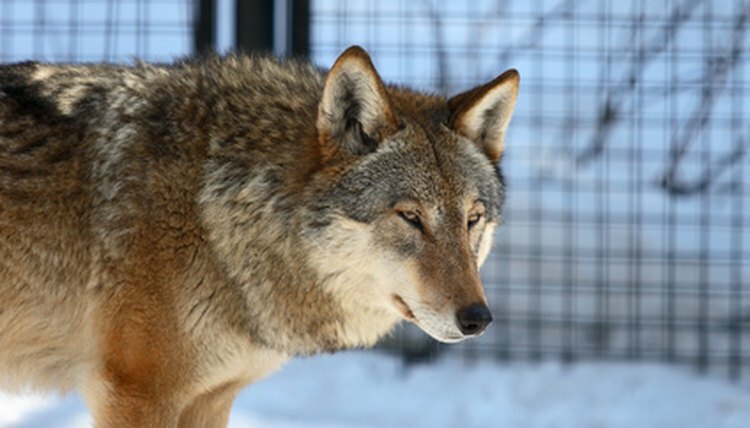 Gray wolves kept in places such as zoos are fed dry dog food formulated for wild canines and a mixture of treats, chicken, mice, eggs and bones. The gray wolf once populated vast areas of North America and Eurasia, but much of their habitat was taken over by humans and large numbers of the species were killed by the 1930s. Now considered an endangered species, the gray wolf's range is limited to parts of Canada, Russia and the states of Alaska, Minnesota, Michigan, Montana, Wisconsin, New Mexico, Idaho and Wyoming.